With news of the recent passing of Sir Roger Bannister I found myself watching video of his historic race over and over, enjoying the beauty and fluidity of his running. Before too long, I also realized it was possible to see from the beginning of the run that at the end his technical struggle would be to prevent himself from falling backwards, and thus short of the world record. Bannister is famous for breaking the 4-minute barrier by, of course, fast running and a feat of imagination, but also through strategy and preparation. For instance, his strategy of being paced for much of the run, and his careful attention to every detail down to sharpening the spikes on his shoes. So the idea of identifying in advance the effects that fatigue will have on one’s gait and preparing for them would have been entirely a consistent move for Bannister…and it’s a strategy you can apply to your own running and racing, to the mental and physical barriers you’re working to surmount. From the very start of the race his back is a little straighter than the others, the thoracic curve flattened. That difference seems to come and go through the run, but about 2/3 of the way through as the camera zooms in it’s easier to see. What does flattening the back do? It lifts the chest and pushes the head slightly backwards relative to the pelvis and feet. This requires Bannister to have to use the muscles on the front of his torso more to prevent his head from falling ever further behind. Eventually, if the effort is sufficiently hard, a runner will fail at this and lose his speed and momentum. It also increases wind resistance by making the torso more perpendicular to the air being pushed aside. 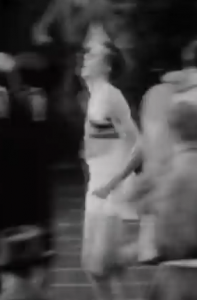 It seems as if Bannister was drafting on his pacers—Chris Brasher and Chris Chataway—so this may not have been so much of an issue until he was running alone, but then it certainly was. Trying to trace this movement to its source, I watched the video several more times to see whether he was attempting to prevent his arms from crossing in front of his body. With no camera shot from the front I simply can’t be sure, but my consistent impression is that this is what he’s doing. His wrists also suggest he’s pulling his hands away from his midline. Do you see how they’re a little loose, with the hands almost lagging behind the arm movements? This can be a consequence of the lower arm moving too far out to the side so that the hand is actually farther out to the side than the elbow is. Trying to keep the hands away from the midline of the trunk is done by contracting the muscles of the upper back between the shoulder blades—the same muscles you’d contract if someone told you to pull back your shoulders and stand up straight. The effect? You’ll lift your chest and your head will move backwards. So my guess about Bannister’s arms matches with what else I’ve noticed about his form. And so although he runs most of the mile with a beautiful lean and leg action, and a flowing quality that suggests good core action, at the end of his run his head moves bit by bit farther backwards, his head tipping, his chest rising, and his legs fighting to keep moving forward. This is by no means an unusual occurrence as a runner fatigues, particularly in shorter distances. 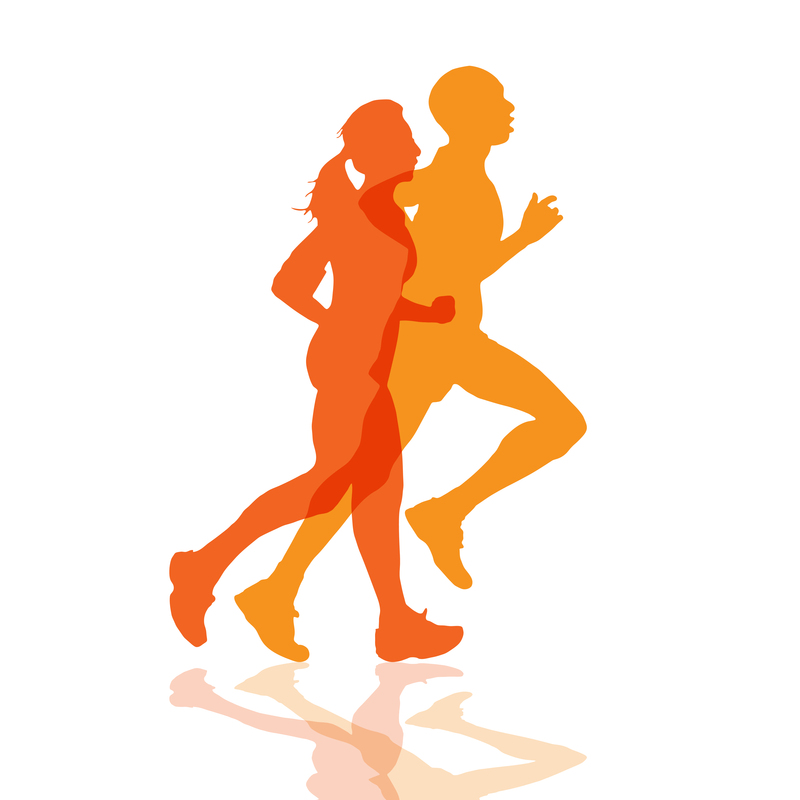 But by running the whole race with the chest slightly lifted, the upper back slightly flattened, the hands pulled slightly apart, and the head slightly farther back than it should be, this effect of fatigue is magnified and those last 50 yards became even a harder fight than they had to be. So what am I proposing Bannister could have done to prepare for this situation? If he knew that this is what happens at the extreme end of fatigue for him, and he were correctly able to trace the predisposing factors in his form, then simply allowing his hands to swing to his midline would have made that increment of difference that he also looked for in every other element of his preparation. What is the point of writing about this now? Well, perhaps you try to stop your hands from swinging to midline too. Or perhaps you also have some other particular thing that happens at the end of races. Most runners do, and know what it is too thanks to race photos. If you can accurately analyze why it’s happening–and accuracy here is key–then you can make your race preparation a little more Bannister-like by making those changes in advance so that when you’re standing on the starting line, the wind drops, and the starter’s gun goes off, you’re fully prepared for the end of the race. My best lesson for honing your forward lean and getting rid of excessive chest lifting or back arching is called “Perfecting Your Footstrike.” That’s because sorting out the lean tends to also cause your footstrike to automatically balance out. Do the lesson and allow your hands to swing to your midline afterwards and you’ll be surprised by your speed. Enjoy! 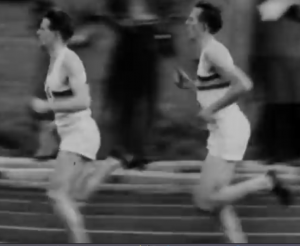 The four minute mile at Iffley road was filmed with a single BBC camera in the middle of the track which somewhat limits the view, but you can get some better views of Bannister in this film of the “Miracle Mile” – Bannister v the new world-record holder, John Landy in the 1954 Commonwealth Games. Landy had a deliberately short, clipped stride. It probably worked well for economy, but less for the explosive kick he might have wanted against Bannister. Thanks very much for the links and observations, Alan!